Infused with the owner’s love for agriculture and art, this heavenly property has been transformed into a magical estate featuring a custom-built home with the warmth and style of a turn-of-the-century farmhouse and 5 acre oasis. A circular driveway leads you up to this one of a kind home with oversized, wrap-around veranda. Pull up to your porte coch’ere and enjoy the tranquil sounds of a copper water fountain. Inside, 18′ ceilings, a nostalgic, chef’s dream kitchen with features you rarely see. The acreage, knows as Ulu Wehi Farm-encompasses organic avocadoes, mature fruit trees including Moro Blood Orange, Valencia and Naval oranges, Tahiti and seedless limes, Meyer lemon, Lychee, Starfruit, Guava and more. A henhouse with fresh eggs daily! Enjoy a farm-to-table experience.! Irrigation for all. A 26,000 sq. ft. Shade house incl. and an artist studio. A thriving plant rental business is also available for sale-sold separately. Come see this award winning 5 acre property today. Please, send me more information on this property: MLS# 201817549 – $3,995,000 – 65-1140 Poamoho Street, Waialua, HI 96791. 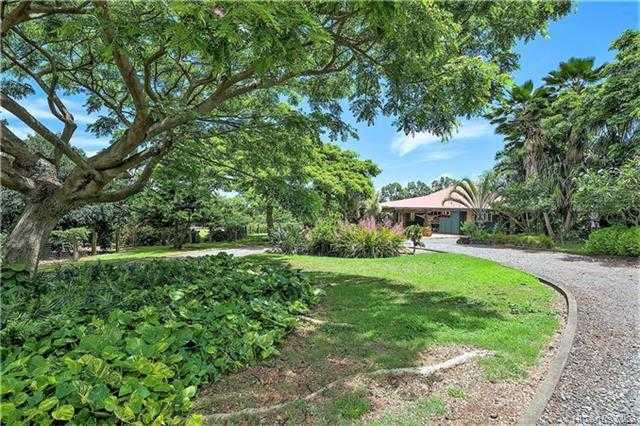 I would like to schedule a showing appointment for this property: MLS# 201817549 – $3,995,000 – 65-1140 Poamoho Street, Waialua, HI 96791.